I'm back in that place again - that blogging funk place. I really want to blog at the moment, i do, but the words just are co-operating........nothing's flowing. I've sat here and typed and deleted and typed.........it's all just blah! Sometimes i can think of lots to blog about, like in bed at night when i'm desperately trying to fall asleep but in my head i'm writing wonderfully worded blog posts - then it comes to the morning and.......nothing. We are in the middle of summer here - lovely long carefree days. So far i'm doing a pretty good job with my hopes list, yesterday i did an op-shop run after i cleaned out my recipe book cupboard and i've had a lovely creative burst - Amity and i spent a day creating some gorgeous softies (the results of which i will share soon), i've also begun collecting pretties for our bedroom makeover. My next plan is to clean out my kitchen cupboards and get rid of all the crap stuff that never sees the light of day. We have a wedding coming up in a few weeks, i found my stunning dress the other day and am really looking forward to frocking up and Amity found her this gorgeous dress. Isn't it beautiful? 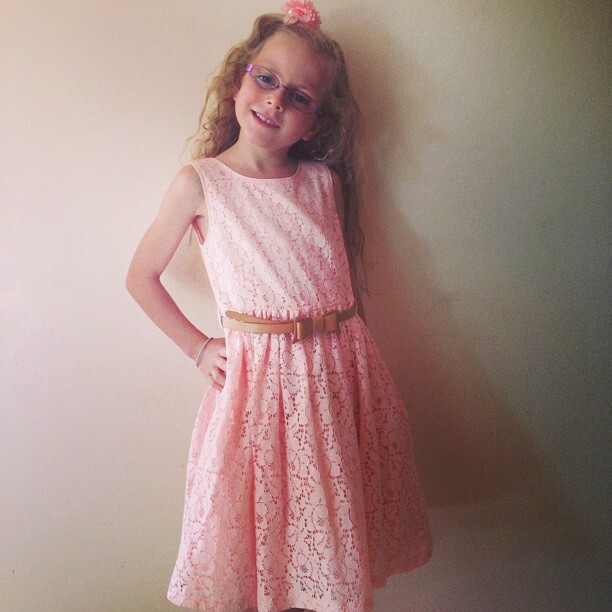 Such a perfect dress for her, she loves it and so do i. Everytime i look at this photo i marvel at how grown up she's looking (and at how much of a poser she's becoming). Well that's enough of my blah, blah, blahing. With a bit of luck next time i'm sitting here having a chat with you, it'll be a little more interesting. *I'm having a lot of trouble lately saving photos on this computer, took me forever to add this one. Computers and i have never really had a good track record & i came close to throwing mine out the window this morning. If future posts have no photos.......you will know computer has won the battle. But i am a fighter - i don't give up easily! No wonder she's posing.... that dress is adorable on her, she looks great. I know what you mean about the words not flowing, I so want to get back to blogging, but life here's a bit boring at present, not much to tell. Oh well.... only boring people get bored, I've been told, so I better get out there and 'un-bore' myself!! I create, i grow, i wear, i cook, i eat, i nurture, i share.